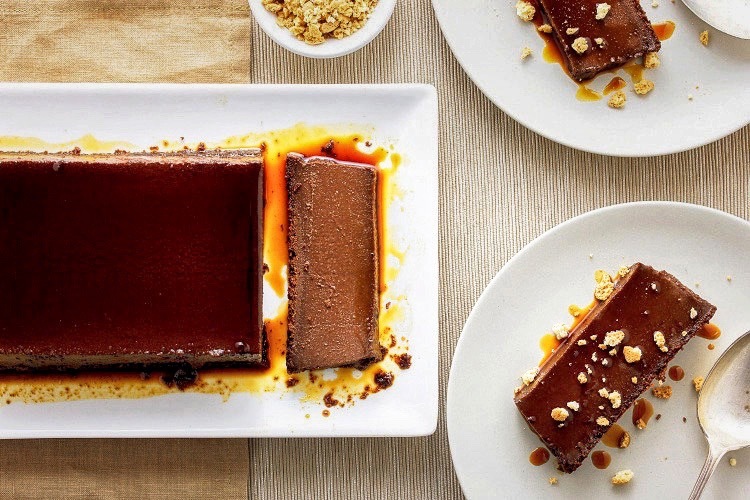 The texture of this jiggly plank of gently baked chocolate custard is dreamily luscious, firm enough to be sliced into slabs with a knife yet yielding to the edge of a spoon, soft and silky once it makes its way into your mouth. On top, a smooth, dark caramel – sweet, of course, with a little salt for balance, and underneath a fine layer of crust, formed by ground biscuits that make their way to the top of the tin as it cooks. For added crunch, I scatter over some more biscuit crumbs just before serving. The biscuits in question are amaretti, the little almond-flavoured Italian biscuits that look a bit like peach kernels. They're easy to find, especially in Italian groceries and delis, or online. The chocolate I use is pure Dutch process cocoa, 24% cocoa butter, because it’s the one I keep. However, because we’re not dealing with baking powder or baking soda here, you could use natural cocoa instead. I think it tastes less chocolatey, but the choice is yours. To protect the custard from the heat of the oven, you need to cook it in a water bath. This is a simple process: just find a roasting or cake tin big enough to accommodate your loaf tin and fill it with enough hot water to come halfway up the sides of the loaf tin. It’s easier to pour the water in when the tins are already in the oven; just start your cooking timing once the oven comes back up to temperature. Plan on making this the day before you want to serve it to give it time to set fully in the fridge. An excruciating wait, but worth it. To make the caramel, place the sugar and water in a small saucepan and stir together. Place over medium-high heat and bring to a boil. Don’t stir; you can swirl it around with the handle, but no spoons (it will crystalise if you do). Continue to cook until it turns pale gold. It will continue to get darker quickly, so watch it carefully. As soon as it becomes dark (it will also smell very distinctively like caramel), pour it into the base of your loaf tin. Set aside. Grind the amaretti to a fine powder in a small food processor (or crush them in a bag with a rolling pin). Set aside. Warm the milk, either on the stove or in a jug in the microwave. Either way, it only needs to be warm, not hot. Place the 3 eggs and the extra yolk and sugar in a mixing bowl. Beat until combined. Sieve in the cocoa and mix thoroughly. Add the vanilla, dissolved espresso powder and the crushed amaretti. Mix well. Add the warm milk at little at a time, mixing well between each addition. Pour the mixture into your loaf tin. Set the loaf tin inside a roasting tin or larger cake tin and pour in enough hot water to come halfway up the side of the loaf tin. Place on the centre shelf of the oven and cook for 50 minutes. Remove from the oven and leave in the water bath until the water is cool, then remove the tin, cover and refrigerate for at least six hours, overnight if possible. When you’re ready to serve, run a sharp knife around the edge of the tin, cover with your serving plate and invert. The caramel will glaze the top and drizzle down the sides. Slice and serve with a scattering of amaretti crumbs.